Beginners, here are the 10 most important training elements you must master, and eight-week full-body beginner's program to start you off on the right foot. All of these men committed serious mistakes along the way, but fortunately we've compiled a summary of the 10 most important training elements so that you, as a beginner, can learn from others' errors. To get you started off right, we've also put together an eight-week full-body beginner's program that's built to challenge you as you get stronger. After that break-in period, you'll have one more thing in common with those superstars: None of you will be a rank beginner any longer. Hungry for more? 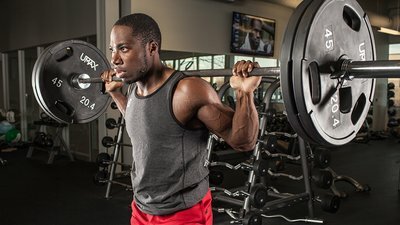 You'll find all the workout plans you need to get started (and keep getting stronger) in Bodybuilding.com All Access. Look for the beginner workouts. There are a lot of guys long on desire, but without the know-how who use the show-up-and-lift-it method, working any and every exercise in the gym every single day and hoping that something happens. Something usually does: They usually quit after about a month because nothing's happened. Fortunately you're on Bodybuilding.com and won't be making those same mistakes. Here's the info you need to understand to get started. Many of the basic movements presented here may be new to you. As a result, your coordination may be challenged at times. If so, don't worry. Keep practicing and rehearsing the movement pattern and soon it will feel like second nature—and that's when your gains in size and strength will take off. Until then, it's important to understand and practice the basic movements before using more challenging weights. Exercises can be categorized into two classes: multi-joint and single-joint. The distinction is that with multi-joint exercises, two (or more) sets of joints work to accomplish the lift. With a single-joint move, only one set of joints is working. During a bench press, for example, action is taking place at both the elbow and shoulder joints, while in a barbell curl the movement is restricted to the elbow joint. Because more muscle is engaged when doing multi-joint moves, you can use far heavier weights and they're therefore better for achieving muscle and strength gains. So how much weight should you lift? Warm-ups are always done with light weight to get the target muscles working in coordination. As a beginner, you'll choose light weights so you can do about 15 reps on each set. The last few reps should be very difficult to achieve but you should always be using "good form." As you progress, you should use even more challenging weights, ones in which you reach muscle failure by 8-12 reps with good form. If you can do more than that number, the weight is too light. Individuals training for strength choose even heavier weights, typically doing fewer than 6 reps. Remember to never sacrifice form to lift a weight that's too heavy. This is key: The lifting you do at the gym is the stimulus that begins a chain of events that causes the muscle to repair itself and make itself stronger the next time you hit the gym. That takes time, nutrients and rest. Clearly, then, you can't train too often, and dismissing good nutritional habits and shortchanging your rest will be counterproductive to your muscle gains. In terms of training frequency, don't hit a given muscle group more frequently than once every 48 hours. As you become more advanced and add volume, you'll want to increase that rest period. If your body responds to the training stimulus by growing stronger but you do the same weight for the same reps each workout, it's just not going to grow any further. Hence, you can't fall into the rut of repeating the same workout week-in and week-out. Strive to do more reps with a given weight or increase the weight from one workout to the next—that's the progressive stimulus you need to keep making positive improvements. As a beginner you'll make noticeable jumps in strength the first two months, but typically gains start to stall when following any given program for too long. That's when it's time to make some larger changes in your training. After the novice period, you can change your training split by re-arranging muscle groups and the number of exercises, sets, and reps on given days. Manipulating all these variables keeps your training fresh and offers new challenges to overload the target muscles. This is an exciting time for beginners because there are few other times in your training career in which you'll see jumps in strength on your basic lifts from one workout to the next. After the novice period, you can change your training split by re-arranging muscle groups and the number of exercises, sets, and reps on given days. Do one exercise for each of the major muscle groups. The first two weeks you practice your form so the weight should be light. Do additional sets if you want to keep rehearsing the motion. The second two weeks you'll add another set. Start with a light warm-up set, then choose a slightly heavier weight for each of your next two sets. You should approach muscle failure by the target rep listed. Don't sacrifice good form to do more reps if the weight is too heavy. You know you reach muscle failure when you can't do any more reps on a given move with textbook form. You'll start with a light warm-up set during the third phase (weeks 5-8), then choose a more challenging weight for your second and third sets. Try to choose a weight so you can just reach the target rep; if you can do more reps the weight is too light, and if you can't reach the target rep the weight is too heavy. Follow this workout three times per week on nonconsecutive days (Mondays, Wednesdays and Fridays).